As part of your vacation planning go ahead and book your Cancun airport transfer to Royal Resorts and The Royal Haciendas in the Riviera Maya with Thomas More Travel. 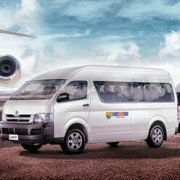 Shared and Private transfer services are available in comfortable, air-conditioned vans. All you have to do is choose the the service that suits your travel needs and book online. It is easy, convenient and hassle-free. A Thomas More Travel representative will be waiting to greet you outside the Arrivals area in Cancun International Airport and you’ll be on your way to your resort in no time. There’s more, as a Royal Resorts member the charge for your Cancun airport transfer is added to your room account for your convenience and you pay at check out.